Antoine de Saint-Exupéry ([ɑ̃twan də sɛ̃.tɛg.zy.pe.ʀi]) (June 29, 1900 – presumably July 31, 1944) was a French writer and aviator. His most famous works is Le Petit Prince (The Little Prince)... The Little Prince was and remains one of the most popular children's books ever, but transcends the genre of children's literature, reminding adults of the value of the innocence of child-like love and belief. The work underscores the foibles of the adult human ego, poking fun at human arrogance and the sense of self-importance. The "Prince," looking at human society with the eyes of an outsider, helps the narrator to understand what is truly important in life. Saint-Exupéry disappeared on the night of July 31, 1944 while flying on a mission to collect data on German troop movements. Jean-Baptiste Marie Roger de Saint-Exupéry was born in Lyon into an old family of provincial nobility, the third of five children of Count Jean de Saint-Exupéry, an insurance broker who died when his famous son was three. His wife was named Marie de Fonscolombe. After failing his final exams at a preparatory school, he entered the École des Beaux-Arts to study architecture. In 1921, he began his military service in the 2nd Regiment of Chasseurs, and was sent to Strasbourg for training as a pilot. The next year, he obtained his license and was offered a transfer to the air force. But his fiancée's family objected, so he settled in Paris and took an office job. His engagement was ultimately broken off, however, and he worked at several jobs over the next few years without success. He later became engaged to the future novelist Louise Leveque de Vilmorin in 1923. By 1926, he was flying again. He became one of the pioneers of international postal flight in the days when aircraft had few instruments and pilots flew by instinct. Later he complained that those who flew the more advanced aircraft were more like accountants than pilots. He worked on the Aéropostale between Toulouse and Dakar. His first story L'Aviateur (The Aviator) was published in the magazine Le Navire d'Argent. In 1928, he published his first book, Courrier Sud (Southern Mail), and flew the Casablanca/Dakar route. He became the director of Cape Juby airfield in Río de Oro, Western Sahara. In 1929, Saint-Exupéry moved to South America, where he was appointed director of the Aeroposta Argentina Company. This period of his life is briefly portrayed in the IMAX film Wings of Courage, by French director Jean-Jacques Annaud. 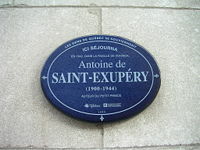 Historical marker on the home where Saint-Exupéry lived in Quebec. In 1931, Vol de Nuit (Night Flight), which won the Prix Femina, was published. That same year, at Grasse, Saint-Exupéry married Consuelo Suncin Sandoval Zeceña of Gómez, a twice-widowed writer and Salvadorian artist. Theirs was a stormy union as Saint-Exupéry traveled frequently and indulged in numerous affairs. While trying to break the record for a flight from Paris to Saigon, Saint-Exupéry and his mechanic crashed in the African desert. Their rescue by an Arab is told in Terre des Hommes, (translated into English as Wind, Sand and Stars), which was published in 1939. Saint-Exupéry kept writing and flying until the beginning of World War II. During the war, he initially flew with the French G.R. II/33 reconnaissance squadron. After France's fall to the Nazis he traveled to the United States, settling in Asharoken, New York on Long Island's north shore and then in Quebec City for a time in 1942. After his time in North America, Saint-Exupéry returned to Europe to fly with the Free French and fight with the Allies in a squadron based in the Mediterranean. Then aged 44, he flew his last mission to collect data on German troop movements in the Rhone River Valley. He took off the night of July 31, 1944, and was never seen again. A lady reported having seen a plane crash around noon of August 1 near the Bay of Carqueiranne. The body of a serviceman wearing a French uniform was found several days later and was buried in Carqueiranne that September. Over 50 years later, in 1998, a fisherman found what was reported to be Saint-Exupéry's silver chain bracelet in the ocean to the east of the island of Riou, south of Marseille. At first it was thought to be a hoax, but it was later positively identified. It was engraved with the names of his wife and his publishers, Reynal & Hitchcock, and was hooked to a piece of fabric from his pilot's suit. On April 7, 2004, investigators from the French Underwater Archaeological Department confirmed that the twisted wreckage of a Lockheed F-5 photo-reconnaissance aircraft (a version of the P-38 Lightning fighter aircraft), found on the seabed off the coast of Marseille in 2000 and extracted in October 2003, was Saint-Exupéry's. The discovery was akin to solving the mystery of where Amelia Earhart's plane went down in the Pacific Ocean in 1937. However, the cause of the crash remained a mystery. Today it is regarded as very improbable that Saint-Exupéry was shot down by a German pilot. The German aerial combat records of July 31, 1944 do not list the shooting down of an enemy aircraft in the Mediterranean on that day. Besides, the wreckage of Saint-Exupéry's F-5 did not show any traces of shooting or aerial combat. Therefore, it is regarded as most probable that the crash was caused by a technical failure. However, some people believe that Saint-Exupéry may have committed suicide, and a diver named Luc Vanrell (who found the crashed plane) is one of few in France inclined to voice publicly the theory that Saint-Exupéry killed himself. It is also said that Saint-Exupéry was rather undisciplined with his use of in-flight oxygen, that he did not regulate it carefully, and may have run out before returning to base, thus passing out and consequently crashing. The Little Prince (French Le Petit Prince), published in 1943, is Saint-Exupéry's most famous novel, which he wrote in the United States while renting The Bevin House in Asharoken, New York, on Long Island. The novel includes a number of drawings by Saint-Exupéry himself, which are reproduced in most versions. "Otensibly a children's book, it makes several profound and idealistic points about life and love. Saint-Exupéry imagines himself stranded in the Sahara Desert, thousands of kilometers away from inhabited places, where he meets a young extra-terrestrial (though entirely human-appearing) prince. In their conversations, the author reveals his own views about the follies of mankind and the simple truths that people seem to forget as they grow older. The essence of the book is contained in the famous line uttered by the fox to the Little Prince: "On ne voit bien qu'avec le cœur, l'essentiel est invisible pour les yeux" (It is only with the heart that one can see rightly; what is essential is invisible to the eye). There are also two other main points in the book, both spoken by the fox. They are: "You become responsible, forever, for what you have tamed" and "It is the time you have spent on your rose that makes your rose so important." The child's perspective of the world, human life and relations between people, which is represented by the Little Prince and partially by the narrator, is set off against the "grown-ups" revealed in memories of the narrator and in the characters, met by the Little Prince on asteroids. But the author underlines that the "'grown-ups' are like that. One must not hold it against them. Children should always show great forbearance toward grown-up people." The Little Prince has been translated into more than 160 languages and, to date has sold more than 50 million copies worldwide and turned into an anime series that ran 39 episodes. It is often used as a beginner's book for foreign language students. The King who can "control" the stars by ordering them to do what they would anyway. He then relates this to human subjects; it is the citizen's duty to obey, but only if the king's demands are good for the citizens. The Conceited Man who wants to be admired by everyone, but lives alone on his planet. Anything that is not a compliment he cannot hear. The Geographer who spends all of his time making maps, but never leaves his desk to explore (even his own planet), going on the pretext that it is the job of an explorer to do so. Even if an explorer were to visit the Geographer, the Geographer is very doubting of any explorer's character and would most likely disregard the report. He doesn't trust things he hasn't seen with his own eyes, yet will not leave his desk. Out of professional interest, the geographer asks the Prince to describe his asteroid. The Prince describes the volcanoes and the rose. "We don't record flowers," says the geographer, because they are only temporary. The Prince is shocked and hurt to learn that his flower will someday be gone. The geographer then recommends that he visit the Earth. On the Earth, the Prince sees a whole row of rosebushes, and is downcast because he thought that his was the only one in the whole universe. He then meets and tames a fox, who explains to the Prince that his rose is unique and special, because it is the one that he loves. The story ends with a portrait of the landscape where the meeting of the Prince and the narrator took place with a plea for anyone encountering a strange child in that area who refuses to explain himself to contact the narrator immediately. A French-language lycée in Santiago, Chile. Saint-Exupery was primarily an adventure writer, who is nonetheless best known for his fable, Le Petit Prince, a child's story for an adult audience. In it his style was simple story-telling, stripped of artifice. His greatest legacy was no so much in literary technique but in the millions who have been influenced by his parable about the a boy and a fox, and in reminding his readers of the profound truth that it is only with the heart that one can see rightly. Saint-Exupéry is mentioned in Tom Wolfe's The Right Stuff: "A saint in short, true to his name, flying up here at the right hand of God. The good Saint-Ex! And he was not the only one. He was merely the one who put it into words most beautifully and anointed himself before the altar of the right stuff." His 1939 book Terre des hommes was the inspiration for the theme of Expo 67 (in Montreal), which was also translated into English as "Man and His World." On December 30, 1935 at 14:45 after a flight of 19 hours and 38 minutes Saint-Exupéry, along with his navigator, André Prévot crashed in the Libyan Sahara desert en route to Saigon. Their plane was a Caudron C-630 Simoun n°7042 (serial F-ANRY). Supposedly the crash site is located in the Wadi Natrum. They were attempting to fly from Paris to Saigon faster than anyone before them had for a prize of 150,000 francs. They both survived the accident, and were faced with the frightening prospect of rapid dehydration in the Sahara. Their maps were primitive and vague, and therefore useless. To compound the problem, the duo had no idea where they were. Grapes, an orange, and wine sustained the men for one day, and after that, they had nothing. Both of the men began seeing mirages hallucinations. Between the second and third day, the men were so dehydrated, they ceased to sweat. Finally, on the fourth day, a Bedouin on a camel discovered them and administered native dehydration treatment, saving Saint-Exupéry and Prévot's lives. In The Little Prince, when Saint-Exupéry talks about being marooned in the desert in a damaged aircraft, he is in fact making a reference to this experience in his life. Saint-Exupéry also talks about this ordeal in detail, in his book, Wind, Sand, and Stars. Consuelo de Saint-Exupéry wrote The Tale of the Rose a year or two after his disappearance, with the pain of loss still fresh in her heart, then put the manuscript away in a trunk. Two decades after her death in 1978, the manuscript finally came to light when José Martinez-Fructuoso, who was her heir and worked for her for many years, and his wife, Martine, discovered it in the trunk. Alan Vircondelet, author of a biography of Antoine de Saint-Exupéry, edited it, improving her French and dividing it into chapters. Its publication in France in 2000, a full century after Antoine de Saint-Exupéry's birth on June 29, 1900, became a national sensation. It has been translated into 16 languages. The heroic fighter pilot now has to make room for the impassioned new voice of his wife, who in the 50 years since his death has been virtually overlooked. Saint-Exupéry is commemorated by a plaque in the Panthéon. Until the euro was introduced in 2002, his image and his drawing of the Little Prince appeared on France's 50-franc note. "From The Murky Depths", by Benjamin Ivry in the Wall Street Journal, April 15, 2004. Official Site of Saint-Exupéry - French language. History of "Antoine de Saint-Exupery"
This page was last modified on 21 November 2016, at 15:47.